Giacomo Santomauro is one of Greensboro’s leading experts on tradition. I’m not referring to the Southern traditions we just wrapped up over Thanksgiving, with squash casseroles and pimento cheese over football games. To Giacomo, the holidays aren’t the only time for the warmth of tradition or the food equivalent of a large pot of Sunday Sauce. Back in the day, back home in New York, every weekend was a holiday through family recipes and treats – families reuniting with third cousins and assortments of estranged relatives – he knows it fondly and has made a career out of it. With an urge to return to his Italian roots, he started Greensboro’s first “Italian Pork Store”. You won’t recognize that name because he named it “Giacomo’s Italian Market” on High Point Road not to confuse us Southern folks into expectations of pork BBQ. It was there he cultivated and grew a base of customers who were looking for the delicacies of the Northeast in Greensboro. Knowing if he put in 100% it would be successful, he aspired for his sausages to become a tradition in the state’s finest restaurants and his shop to become a neighborhood stopping ground. He moved his store to New Garden Road and opened a sausage production facility in Elon, NC. Today, his sausages are prepared in a number of restaurants and food trucks, sold in Harris Teeters and Fresh Markets and his shop is thriving. Walking into Giacmomo’s Italian Market on New Garden Road feels like traveling back in time. And when walking out, you wonder why you’re missing the L train in Brooklyn. And, it’s intentional. It’s what makes his loyal customers feel at home in their Southern neighborhoods. Like any local food producer with honor for their roots, he exceeds the definition of passion. It’s his loud tone and subtle sharing of family secrets that make his products so good – aged provolone, locatelli cheese, imported mortadella, pancetta and prosciutto from Italy. He imports the best from Italy and makes everything else himself in his Elon production facility. Giacamo’s store is stocked with Italian imported dry and canned goods, exclusive Italian delicacies, homemade soups and stocks, meals to-go, his signature sandwiches and a plethora of deli meats and fresh Italian sausages, meatballs and cutlets. He’s a self-claimed “Italian snob” knowing exactly what he wants with no substitutions. Don’t even try to order something like a meatball and roasted red pepper sandwich – Giacomo will shout at you with dissatisfaction! Although with an Southern charm, he’ll compromise by allowing you to order the peppers on the side — but won’t watch your own assembly. The next phase to Giacomo’s business is his internet business “Salamis by Mail”. With only a dozen salami makers in the US, Giacamo is entering a niche market with real Italian sausages made from NC Hog Country shipped anywhere in the country. He’s selling an array of gift boxes stuffed with Giacomo approved salamis and cheeses made right on New Garden and shipped across the country. You won’t miss the family touch, as his family tradition translates to online sales. I’ve seen the evidence on a typed order to Giacomo from a stranger in Arizona signed “Aunt Prissy.” Make sure to consider a touch of shared Greensboro tradition this holiday season at salamisbymail.com. 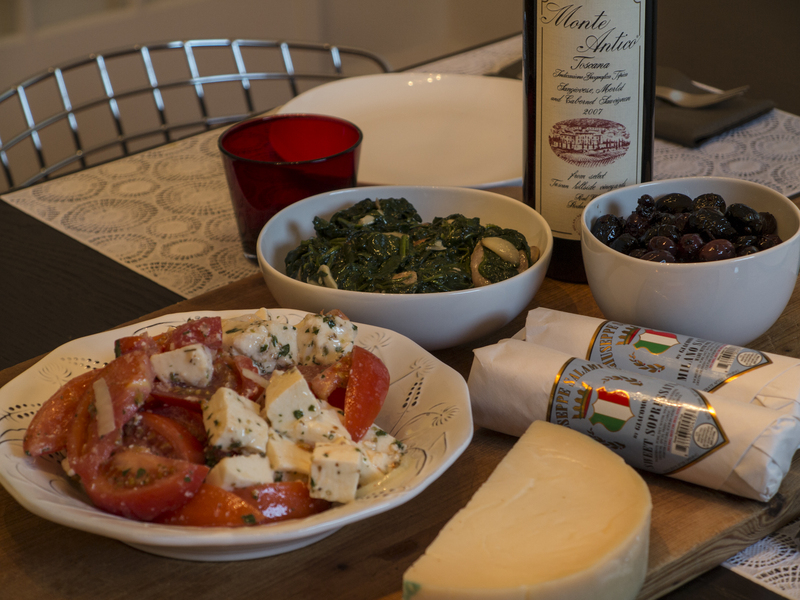 During the holidays, the easiest meal is an antipasto tray with assortments of Giacomo’s favorite cheeses, meats and salads. But, if you’re looking for something warmer, try his family’s recipe for Sausage Risotto! In a large, heavy bottomed pan, heat 1 or 2 tablespoons of olive oil on low heat. Add chopped onion and cook patiently until soft and translucent. Remove casing from the sausage and break into pieces. Add sausage to onions. Turn up the heat to medium or medium-high and brown the sausage. Once browned, add one cup of rice and coat with oil. On low to medium heat, add chicken stock one cup at a time. Allow the rice to absorb the liquid and then replenish with the next cup. After 20 minutes of stirring and adding liquid, taste test the rice for tenderness. Adjust stock to finish with a risotto that is tender but with enough liquid to keep moist. Add freshly grated cheese. Season with salt and pepper. Enjoy with a simple salad tossed in oil and vinegar.